Journal: Who are you? Tell me a little about yourself. Journal: Write about your relationship with your phone. How do you feel about it? In what ways is it helpful/ hurtful/ joyful/ sorrowful? Journal: Compare and contrast your two "Where I’m From" poems. Journal: Write an MLA style header for an assignment due today. Homework: MLA Assignment - find it on Ms. Bacon's library page by clicking "Gilpin"
Journal: • Write an MLA style in-text citation for the following book, if the quote came from page 88. •James, Henry. The Ambassadors. Rockville: Serenity, 2009. Print. Journal: Write down a fun fact about yourself that is not true for anyone else in the class. Where I'm From Rough Draft due on Turnitin.com 8am tomorrow morning! Journal: Write about your name. For example: Why did your parents name you it? What is the origin of your family name? Do you have a middle name? Do you like your name, why or why not? 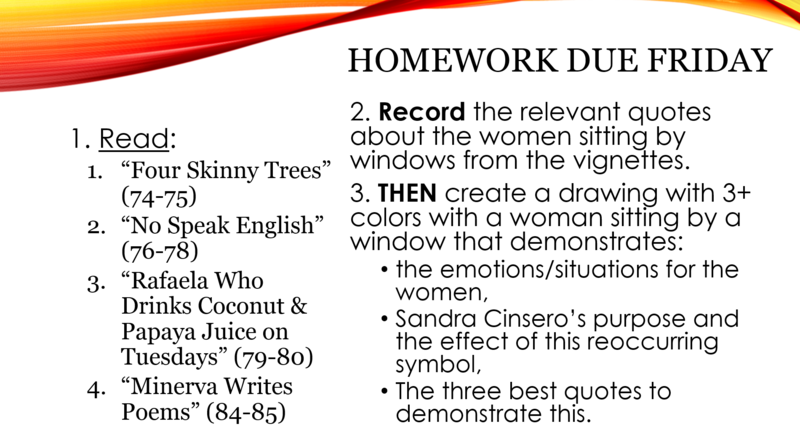 Homework: Where I'm From final draft due Thursday 8am on Turnitin.com! Do you like it? Why or why not? Homework: Where I'm From final draft due TOMORROW 8am on Turnitin.com! Journal: Make a list of literary devices. Journal: Write a sentence personifying your given noun. (If absent, use the noun: cake). Journal: After whom was Esperanza named? What does her namesake's story tell you about the status of women in Mexican society (culture)? Journal: Create your own unique euphemism. Put it in a sentence so we can understand it from context. Journal: How do cultural differences affect cultural interactions? Journal: What can clothing symbolize in a story? Journal: Friday Free Write! Write for 5 minutes on any topic. Journal: Introduce yourselves to your new table group and write down each person’s favorite thing (so far) about Skyline. Homework: Make sure you're caught up on reading through page 69. Journal: Write a theme statement for the video clip. Journal: What is your favorite vignette so far and why? Journal: Quiz reflection: How did it go and why? Journal: Respect during hard conversations: Why is it important to be respectful? How can we be respectful? Journal: Compare/Contrast Tito’s mother’s reaction to him kissing girls with Sally’s father’s reaction to her talking to boys. Journal: Friday Free Write! Write for 6 minutes. Homework: Finish reading HOMS by Monday! Journal: What is the importance of having a clear thesis statement? Homework: If you did not finish in class, write your thesis statement on an index card with your name on the back. Journal: What are the three parts of a thesis statement? Homework: Study for HOMS test, Thursday! Graphic Organizers due! Journal: What are the five types of figurative language that will be on the test? Give an original example of each. Homework: Study for tomorrow's HOMS/Figurative Language test! Graphic organizers due! Journal: How can we make using laptop carts easy and fair for everyone?